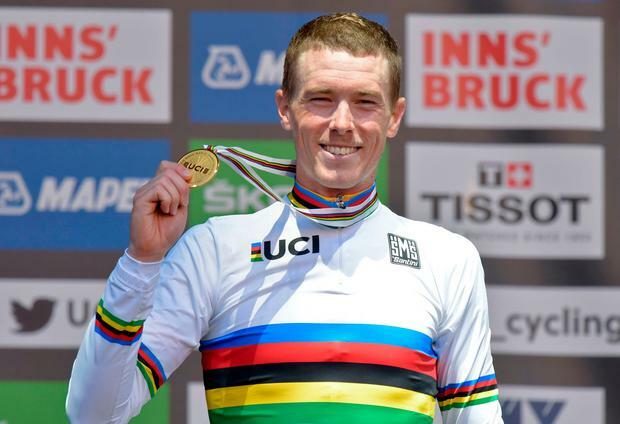 Ireland's Ryan Mullen felt he "let the team down" after finishing 49th in yesterday's World Championship time trial in Innsbruck, which was won by Rohan Dennis. The 28-year-old Australian crushed the rest of the field to win his first world time trial title, completing the 52.1km course, which included a testing 5km Gnandenwald climb, in one hour three minutes and 2.57 seconds - more than a minute faster than his rival. Defending champion Tom Dumoulin finished 1min 21.09sec back, having found the climb tough going, to claim silver just ahead of Belgium's Victor Campenaerts. Ireland's Nicolas Roche finished 46th, with Mullen three places down, in a disappointing performance for a the U-23 silver medallist in 2014. "Then after ten minutes my legs and my body just said no and I've no idea why. I had a strategy of holding certain watts on the flat and I was way, way down on what I know I can do and what I've done in the past. "Without getting into details, when I finished I was between 80 and 90 watts off what I should have done. "If you have a bad day it's usually within 10 to 20 watts, not 80. I don't know, I've no idea. I've never performed that badly before at the World Championships and I kind of feel really embarrassed about it. "I feel like I've let the team down. I'm sure they're understanding but the athlete inside me is pretty p***ed off." For Roche, the result was less surprising as he struggles to recover from the Vuelta a Espana. "I was motivated, ready and focused over the last ten days on just riding the TT bike and everything but unfortunately I was just empty today," he said. Dumoulin has had to get used to playing the bridesmaid this year, after also finishing second overall in both the Tour de France the Giro d'Italia. "It's a dream come true to be world champion," Dennis said. "I've been chasing this since I was a junior, I've never won it in any age group, so to win my first one in seniors is really special. It's an amazing feeling." Road racing begins today with the juniors taking centre stage. Lara Gillespie and Maeve Gallagher go for Ireland in the women's race over 71.7km, while Aaron Doherty, Ben Healy, Breandán Flannagan and Archie Ryan wear green in the men's event over 132.4km.